Chances are when you think of compression socks, seniors come to mind, but that isn’t the only audience for the best compression socks. Compression socks serve multiple purposes and are extremely useful for all types of people. They have benefits that are useful for athletes, travelers, and those with health needs. Almost anyone can benefit from having a good pair of compression socks from time to time. See the top 5 best compression socks and everything you need to know about them. The name says it all when it comes to these travel socks. These Wanderlust socks are designed to be the perfect pair of travel socks for your long journeys. Whether you’re flying intercontinental or going to be sitting for a long time and need comfort and protection for your feet, these Wanderlust socks could be right for you. Relief for pain and swelling: These socks help prevent ankle swelling without leaving red marks. Some people use these socks to help with issues like plantar fasciitis, pregnancy, and arthritis. 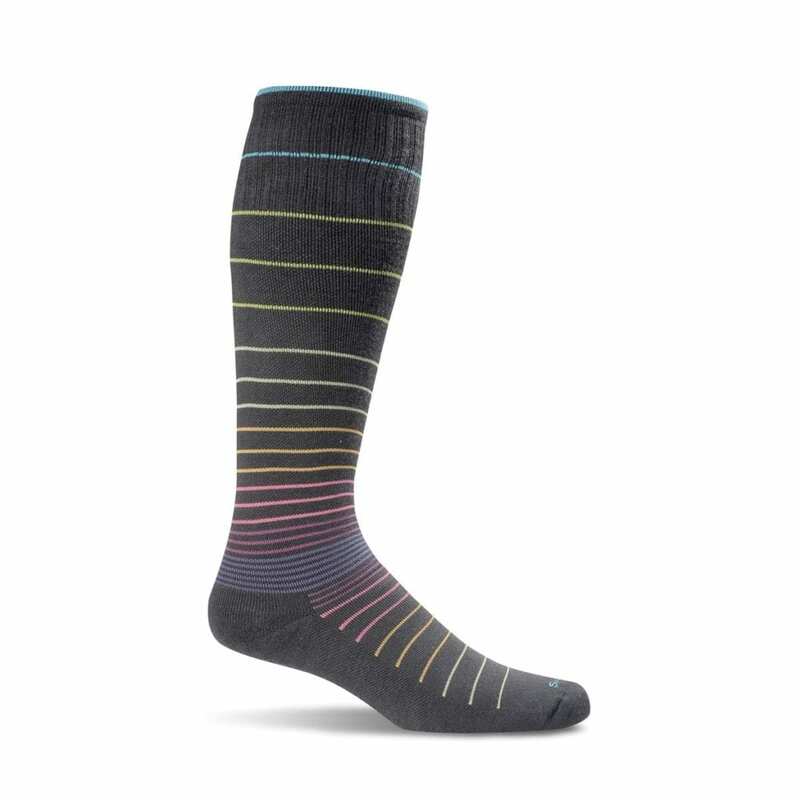 Satisfaction guarantee: If these compression socks don’t fit, provide relief, and energize your feet, the company will refund your purchase or send you a new pair for free. Seamless toe box: The toe construction helps to prevent blisters. 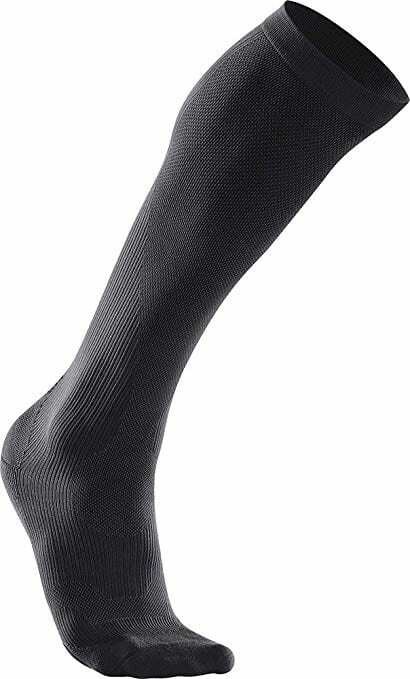 Tight compression: These socks are medical grade with 25-30 mmHg compression. Tight tops: Some customers complain about the socks being tight at the top. VitalSox is known for its comfortable compression socks that are perfect for a long day at work. If you sit at a desk for hours on end, then these socks would be a great option for you. You can feel compression starting from the arch of your foot and travels up to the calf for the utmost comfort level. The VitalSox compression socks are also typical among the running crowd. The Vitalsox come pre-washed, so they are ready to wear as soon as you pull it out of the box. Anti-fungal material: The material is protected from odor and fungus because it has quick-drying polypropylene infused with silver. Four-way stretch: This high-quality stretch helps you keep the socks in the right place on your leg. Graduated compression technology: The company has found the ideal range for compression to benefit athletes, pregnant women, and travelers. The compression level is tested to ensure maximum circulation increase. Light padding: The padding is light enough that it doesn’t get too tight on your feet. Multiple colors: These socks come in lots of color options, so you’ll be able to find a pair to match your unique style or particular outfits. Heat retention: These socks may not be great for hot travelers because they retain a lot of heat. If you’re going to wear a compression sock for a long amount of time you want one that is anti-bacterial, odor-resistant and comfortable. 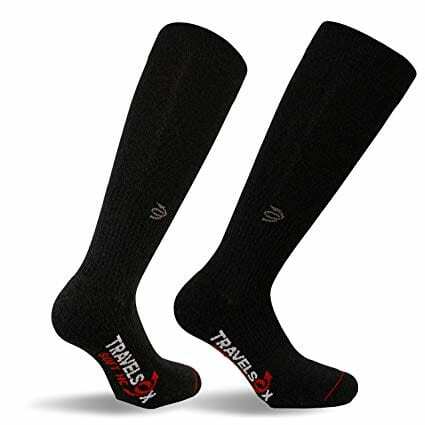 The Travelsox compression sock is one of the best compression socks for travel because of its comfortable construction. With the Travelsox you can ensure proper circulation if you’re taking a long flight or even working a long day. Four-way stretch: The stretch makes it easy to put the socks on. Heavy duty: These socks are sturdy but still thin enough to fit into shoes. Patented compression: The specialized compression gives you plantar and arch support. Bigger socks: The sizing runs big, so you may need to order a smaller size than you normally would. One of the biggest complaints with some compression socks is that they retain too much heat. Sticking your feet into a tightly fitted sock for a certain amount of hours can result in a hot, sweaty foot. With sweat comes odor, discomfort and a build-up of bacteria. Luckily the Sockwell Circulator Compression Socks are known to be one of the coolest socks out there. The socks are good at absorbing moisture while keeping the foot clean. Sockwells are the perfect socks for long-haul flights. Compression zones: Four graduated compression zones help keep your feet feeling energized and pain-free. Seamless toe: You won’t experience irritation that you might have in other socks because the toe is seamless. Temperature regulation: These socks keep your feet temperature regulated, and they absorb moisture to keep you comfortable. Wears quickly: Over time, the sock may wear out. Athletes are always in the market for a great compression sock that will reduce pain and fatigue during a workout. If running is your forté, you need a lightweight, reliable sock to wear during a run. The 2XU has excellent circulation throughout the calves, shins, and ankles and increases the blood flow during wear. Additionally, runners don’t need to worry about air circulation and moisture retention. These running compression socks use advanced graduated technology with it’s zoned placement and moisture wicking. This technology significantly reduces muscle stiffness, provides optimum support, and increases breathability. Athlete quality: These socks are a top pick for long-distance runners, meaning they’ll stand up to a lot of aggressive use. Compression gradient: The compression is designed to support the calves and shins. Moisture-wicking: This feature helps keep you dry. Compression strength: The socks may be hard to put on due to compression strength. Fabric weakness: The fabric may snag after some time. Compression socks are more than just tight socks — there is advanced technology behind them. Compression socks add pressure to your legs and feet. People wear compression socks for many reasons, but the most popular is for increased blood flow to reduce swelling and blood clots. The benefits of wearing compression socks are a lot more than that, and the people who wear them range from all ages and backgrounds. 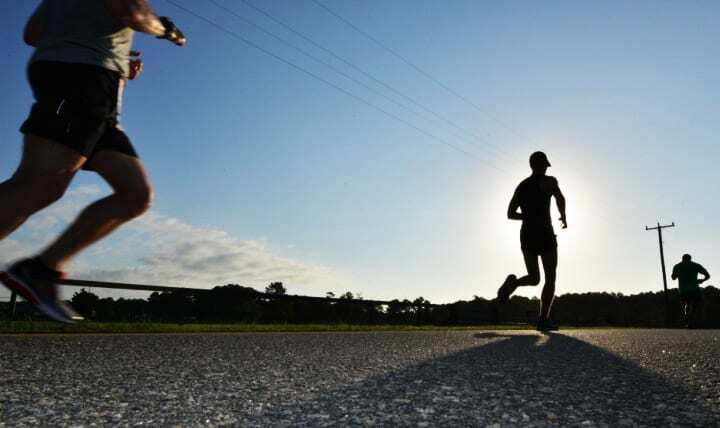 Athletes, especially runners and people who do extensive muscle work. These people wear compression socks to help with muscle recovery and joint pain. A compression sock can significantly reduce muscle pain or stiffness you may feel after a strenuous workout. Also, many socks have plantar and arch support to help with plantar fasciitis, one of the most common runner’s issues. Desk workers also tend to have circulation issues. Compression socks at work will apply the appropriate amount of pressure so that you can get proper blood flow to your ankles and toes even when you’re at your desk all day. Frequent travelers use compression socks to help prevent common types of discomfort during travel. People with various medical conditions can sometimes benefit by getting more blood flow to the legs and feet. People who are pregnant, have diabetes, or are recovering from an injury or surgery can wear these socks to help prevent foot pain, circulation problems, swelling, and varicose veins. As you can see, compression socks can help people in all kinds of circumstances. However, some people with specific health problems such as severe vascular disease should not wear compression socks. Talk to your doctor if you have any concerns. Pregnant women, diabetics, and others should discuss their desire to wear these socks with their doctor to be sure they get medical grade compression socks that will help with the difficulty they are facing. Frequent travelers are often fans of compression socks, but why wear compression socks when flying? If you have travel shoes or bring a travel pillow to make sure you’re comfortable on a plane, don’t overlook the value of compression socks. 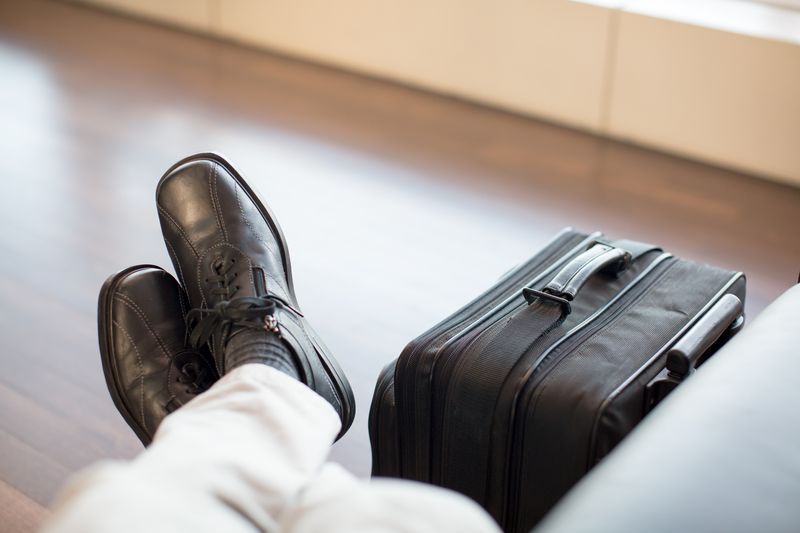 If you fly frequently, you know that your feet and ankles can swell after hours on end of sitting down. This condition is uncomfortable and a considerable health risk. The swelling happens because of the change in pressure and not enough blood circulation. Certain people with this health issue could be at risk for a blood clot. Compression socks can help reduce some of these frequent flight woes. The blood clot that you are at risk for getting when you fly frequently is called DVT or deep vein thrombosis. Instead of circulating upward, the blood gets caught in a vein. 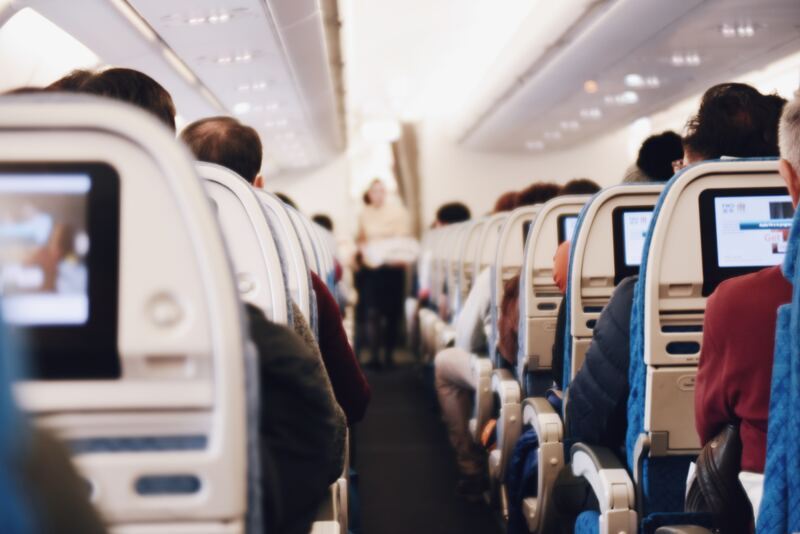 This blood is not only a health risk, and the risk is exponentially higher when you fly regularly. 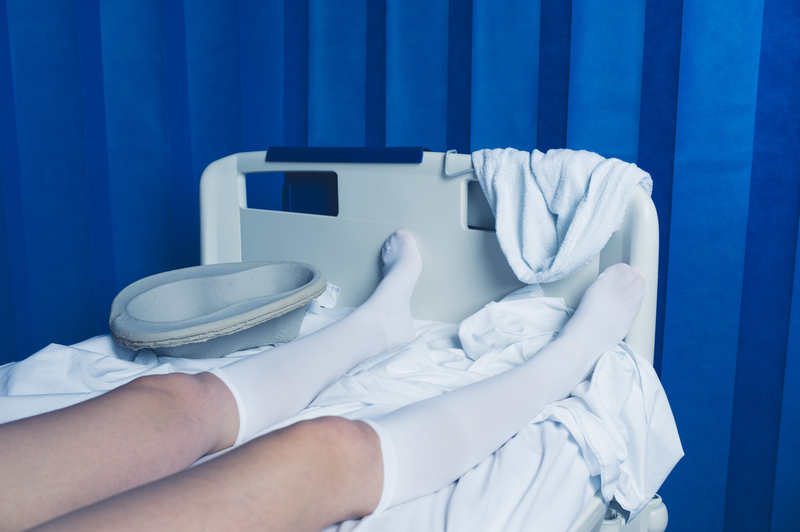 Luckily, doctors can quickly treat DVT when they catch the problem early on, but blood clots are dangerous. You don’t want an issue if you can avoid it. Reduce the chance of these problems with a few pairs of compression socks. If you’re going on an international trip, the best thing for you and your feet is to invest in a good pair of compression socks. 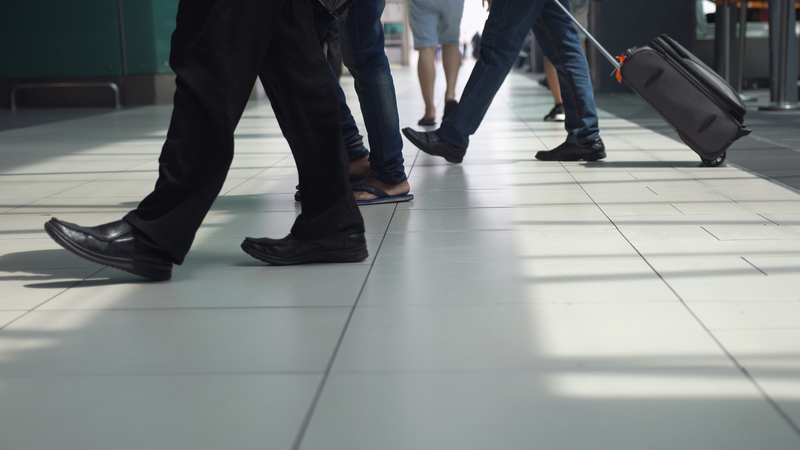 Besides the risk of DVT, swollen feet and ankles are all too common among the well-traveled crowd. Deplaning while wobbling through the airport with puffy feet is less than exciting and extremely uncomfortable. Wearing a pair of the best compression socks for travel is a way to avoid this pesky issue and survive long-haul flights. Even if you don’t suffer from bad circulation, these types of socks will provide pain relief and swelling prevention. Pack a few extra pairs of compression socks in your packing cubes so you can have socks to protect your feet through your whole trip. Just like any other travel product, compression socks come in several shapes and sizes. For those new to the best compression socks for travel, see the vocab words and considerations that will help you find the right compression socks for you. Compression socks are meant to be tight, but choosing the wrong size can make them much too tight or too lose to do any good. Most compression socks are graduated compression, meaning they have different levels of pressure distributed throughout the sock. If it doesn’t fit correctly, the force could be in the wrong spot on your leg, causing discomfort and defeating the purpose. Research reviews and size guides for each company before you buy. Look at your shoe size and foot measures to compare them to the size guide online and sock measurements from the company you’re considering. Use these guides to avoid getting an ill-fitting pair of socks. 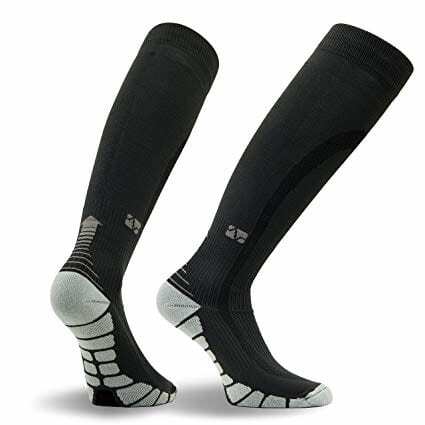 The standard length of these compression socks stretches up to the calf. Get a sock that fits up to the calf to give you the best blood circulation. Breathable: If you’re a runner, get material that breathes well and doesn’t hold in odor. Look for Silver DryStat, which is an antibacterial and antifungal material found in a lot of compression runner socks. High-quality: Choosing a sock with comfortable, non-itchy fabric is number one because of the tightness and the length of time you’ll be wearing them. The material of a compression sock must also be elastic and good quality. Lightweight: Lightweight socks are also a priority. 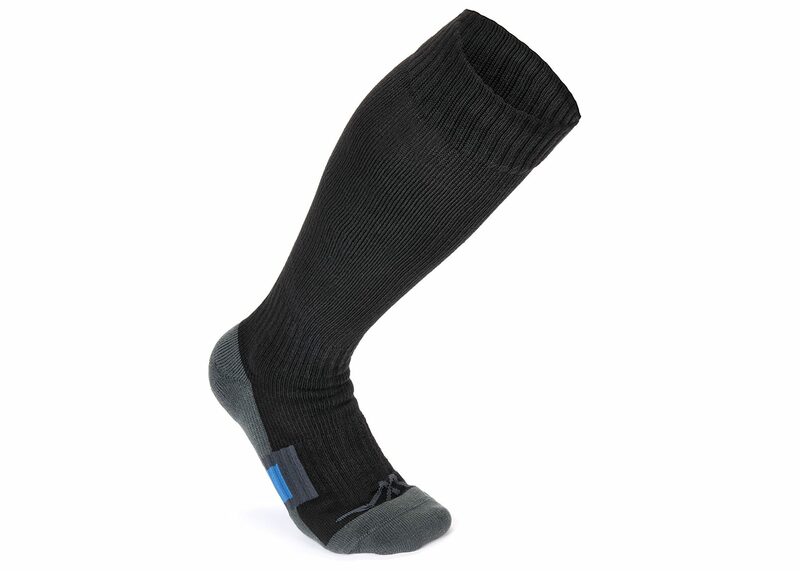 Heavy-duty, thick socks tend to be extremely uncomfortable, especially if you’re an athlete or stand all day for work. Most of the best compression socks for travel on our list are known for their lightweight fabric that is easy to breathe. So what are the different types of fabric? Socks usually have a mixture of synthetic and natural materials. You’ll probably find most socks have a mix of various types of synthetic fabrics like polyester, acrylic, and spandex. These materials will be lightweight, moisture-wicking, and breathable. Synthetic fabric generally does well with keeping out odors too, because most of the material is antibacterial and antifungal. When the sock works to pull moisture away from your skin and to the surface of the product, you’ll have less odor buildup. A typical natural fabric to find in travel compression socks is cotton, but socks are not usually pure cotton. Socks usually need some synthetic materials to allow compression and elasticity. When cotton is in conjunction with other synthetic fabrics, the sock will often have better cooling and breathability. Cotton can also help reduce itching and make the socks softer and more comfortable. Check the specs of your socks because too much cotton can means less moisture wicking and more sweaty feet for some people. Now here are the questions you’re probably wondering: How tight should compression socks be, and how tight is too tight? The answer depends on your need as an individual. There are levels to compression socks. Each level serves a specific purpose, so research the levels before buying new socks. Light: 10-15 mmHg. Light compression is usually around 14mmHgs. This level is a great place to start for people who are new to compression socks and don’t have any serious health issues that require the socks. If you have tired legs or slight irritation, light compression is ideal. Mild: 15-20 mmHg. This range is the target area for those who struggle with swelling after a long flight. This range of mmHgs is good to prevent DVT for people who sit down for an extensive amount of time. Moderate: 20-30 mmHg. Anything above the 20mmHg is considered medical grade level compression. These should be for people who struggle with varicose veins, extreme swelling, and joint pain. 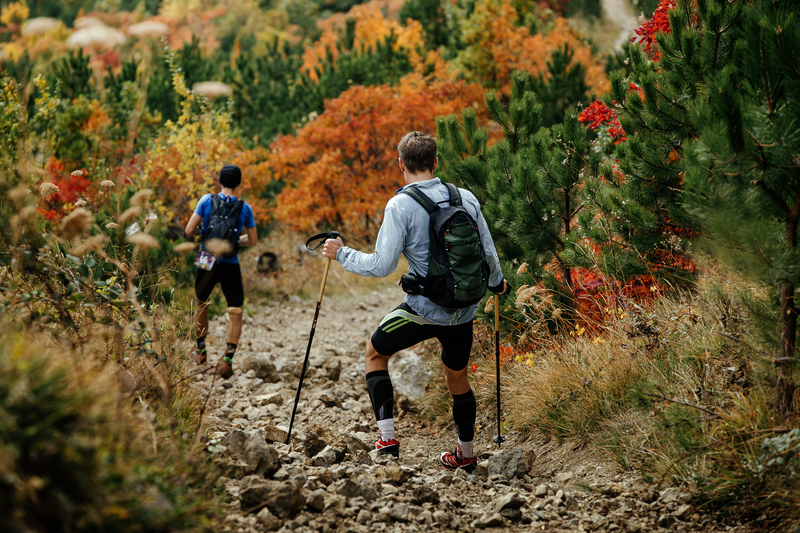 If you suffer from those issues but still want to tackle hikes in your favorite national park or long flights to the Middle East, use a moderate grade of compression to help you be more comfortable. Firm: 30-40 mmHg. Before you choose a pair this firm, consult with a healthcare provider. They can tell you which level of compression you need depending on your body and your symptoms. A pair that is too tight is uncomfortable and cancels out the many benefits of wearing them. However, some people need this level of compression to get the advantages of the socks. Again, if you have any medical needs, talk to your doctor about if you need medical grade socks or what compression ratings you need. The level of maternity compression needed may differ from what someone with diabetic varicose veins needs. When you travel, the best compression socks can help keep you comfortable. Use this guide and our list of the best compression socks for travel to help you have a better experience on your next journey.